Many people look at airports as only a gateway for travel. However, these travel centers also directly impact their host cities and economies, and because of that they get a lot of attention from local media. "Most newspapers and TV stations don't have someone whose sole beat is the airport," notes Michael McCarron, San Francisco International Airport director of community affairs. "[Yet] even with that, I still have no shortage of coverage." 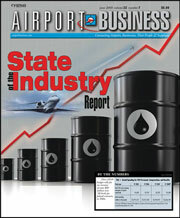 John Infanger, editorial director for the print and online trade outlet Airport Business, notes that coverage of airports has evolved recently as airlines struggle with a range of high-profile issues, from labor negotiations to rising fuel costs. "Up until 2008, a lot of our focus has been on commercial airports and their efforts to attract new services and more destinations," he says. "Today, it's a lot more on keeping the services that they have." Along with business stories, Infanger adds that other issues, such as airport security, receive more attention from the media, especially since 9/11. "We're also doing a lot more government coverage as government officials get more heavily involved in regulating airports from a congestion standpoint," he adds. Jonathan Dean, communications manager at Baltimore/Washington International Thurgood Marshall Airport, notes that many airports are considered small but important communities of their own. "Airports are really little cities, and so there are any number of issues we may face on a day-to-day basis," he explains. "Everything from business and finance, to air service, to capital improvements, to travel advisories, to security, all get regularly covered by the media, and there are even community papers that cover the airport as a neighbor." Because the media is focused on almost everything the airlines do, Dean says he spends a lot of time making sure the airport isn't unnecessarily brought into stories. "Local reporters often come out for stories on things such as the airlines adding new fees [to] baggage," he says. "But for us, it's a matter of staying in our lane and letting reporters know that just because it's happening at the airport doesn't mean it's an airport story." However, there are few media outlets with dedicated airport beat reporters outside of the trade publications. So, Infanger says the airports have to act more proactively to educate both the general media and public about how they operate. "I speak at conferences regularly, and one of the top points I make to airport executives is if you have a message you want get out, there are professional PR people who do this for a living," he says. "Because the people who run airports do a good job, but they often don't know a lot about PR." Make sure you tell reporters that airlines are tenants of the airport, and that the current woes faced by many carriers should not impact how they cover a local airport.